MAALAEA  Despite intensive efforts to save him, a rare dwarf sperm whale stopped breathing and died in a boat Monday morning just short of being released in waters between Maui and Kahoolawe. 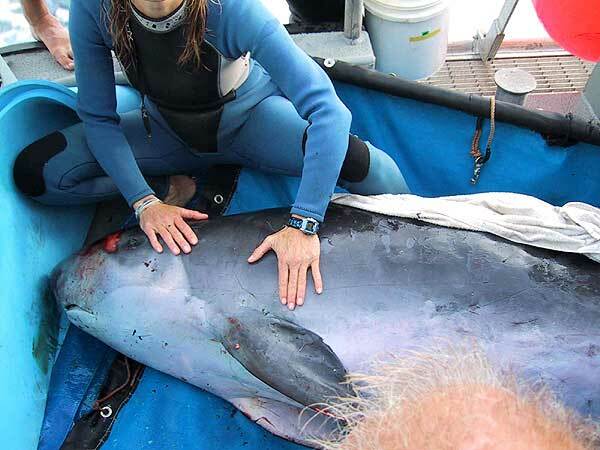 "He didn't make it," said Hannah Bernard, director of education at the Maui Ocean Center. "He died on the way out at almost the spot where he was to be released. It was quite a shock." The 7.5-foot-long whale had been pulled from the water after beaching itself on Sunday morning in the shore break at Kamaole Beach Park I. It was taken to the Maui Ocean Center for overnight observation, and, according to Bernard, it had done well. "We thought it was strong," she said. Bernard said the whale had suffered some minor lacerations from what appeared to be either cookie-cutter-sized shark bites or injuries sustained while beaching. There was some bleeding, but "he didn't seem to be bleeding so much that we were afraid for his safety," she said. Those who examined the whale felt it was a "prime candidate for release," she said. "It was a big surprise when he died," Bernard said. "There were definitely tears on that boat." Scientists initially wanted to bring the whale's body back to shore for a necropsy examination to determine the cause of death, which Bernard said is believed to be some sort of cardio-pulmonary failure. But Native Hawaiian cultural specialist Charles Kauluwehi Maxwell and two Native Hawaiian divers persuaded them to return the whale to the ocean. Maxwell said it was the "pono" or right thing to do to let the whale return to the ocean. "Spiritually, that's the way it had to be," he said. Maxwell, who serves as cultural adviser at the Maui Ocean Center, said the whale had showed such life as people cared for it through the night at the center in Maalaea. "People were petting him. Everybody was volunteering," he said. Then, just three miles out of Maalaea Small Boat Harbor, the whale stopped moving and made no noise at 6:20 a.m.
"It was quite a shock," Maxwell said. "It was very sad." He said he held a brief ceremony for the whale. "I prayed for its soul," he said. Maxwell gave the whale a maile lei and "it sunk down and it was returned to the ocean as it was supposed to be." "It was a wonderful thing," he said, as those who cared for the whale "put the spirit of the whale to peace." To Hawaiians, the whale is a representation of the Hawaiian god, Kanaloa, the god of fish and animals in the ocean and greenery on land, Maxwell said. Bernard said there's usually something wrong when a whale beaches itself, since such behavior is not normal. "It's one of those bewildering mysteries when whales strand," she said. But Bernard said everyone did what they were supposed to do in trying to rescue the whale. "We did our best," she said. "Everybody did the right thing." Bernard said that with wild animals, particularly with deep-water species such as the dwarf sperm whale, it's considered best to put them back in the wild as soon as possible. Veterinarians reported the whale's injuries were not likely to have been caused by humans, and bullet wounds were ruled out as the source of injury to the animal. Dwarf sperm whales are rarely sighted around Hawaii. Since 1991, there has been only one confirmed stranding off of Kailua, Oahu, last year, according to the National Oceanic and Atmospheric Administration. The species has a squarish head and a lower jaw, which is underslung like a shark. Individuals can grow up to 9 feet long and weigh between 300 and 600 pounds. They travel in groups of as many as 10. Although little is known about the species, it is believed to live in continental shelf areas where it feeds on deep-water fishes and other marine life.